For keen hikers the internationally renowned GR 20 trail is a must. Crossing Corsica from northwest to southeast, the GR 20 is 170 kilometres long with an average altitude of between 1000m and 2000m. 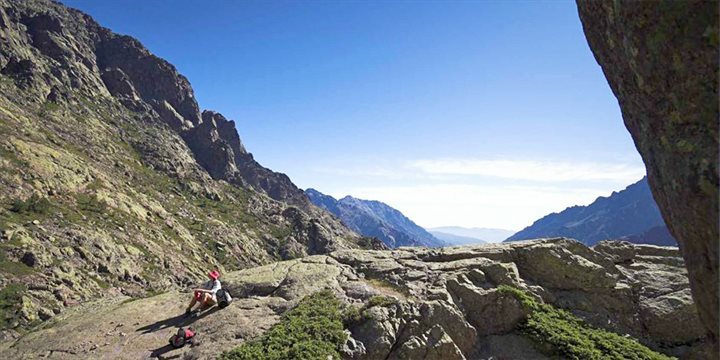 Starting in Calenzana in the Balagne region and finishing in Conca near Porto Vecchio, the GR 20 path follows the mountain ridge that cuts across Corsica and attracts around 10,000 hiking enthusiasts every year. This legendary trail cuts through a diverse range of landscape including forests, granite moonscapes, windswept craters, glacial lakes, torrents, peat bogs, maquis and snow-capped peaks. Possible from June to September, the hike requires a high level of fitness, the right equipment, a good head for heights and some climbing experience - in its entirety it takes approximately two weeks to complete. Only one in three walkers complete the trail but you can aim to do half if desired, thanks to the train station mid-trail in the pine-hidden village of Vizzavona. Many refuges can be found en route on the GR 20, marking the end of each stage which offer basic accommodation with cooking and dining facilities as well as basic supplies. More comfortable gîtes d'étapes are also available. Corsican Places offers the widest range of flights from the UK. We can also arrange a stay at a hotel, villa, apartment or village house if you wish to extend your time in Corsica with a week's relaxation.